Can you update description of the addon? Especially changelog is severely outdated and doesn't make much sense. This quest should be from "Darkmoon Island" and not Elwynn. Those quests in (lower) Blackrock Spire no longer exist in-game but appear in-addon. Will remove these in the next version. 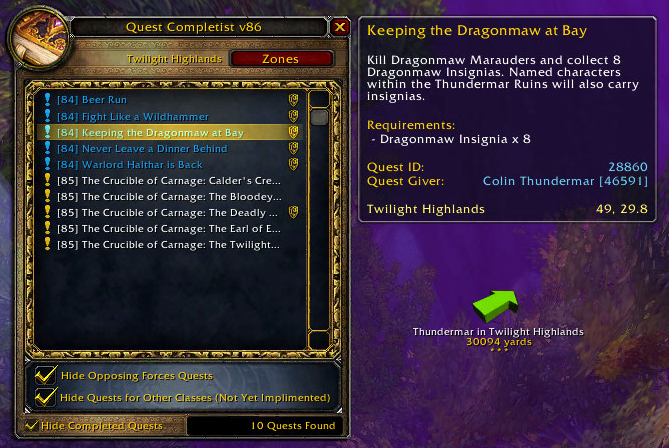 About 28068 and level cap quest qc domt have any way to deal whit these quests atm,.Hide low level quests implantation as never finished :( this is way i have started to remove bonus quests from the questdb aswell but wowhead domt have its own categorie so its time consuming. Dk and Dh`s fix for this one s no problem whit just removeing the class bit value but i dosnt relly solve the general level cap problem. Hello dear addon developer, I was curious if you are going to update this addon for wow classic release as some of us are looking to complete all quests. It`s planned from my side too update the quest/pin db. From what i read earlyer the api is gonna be same as Bfa so function wise it should be fine (only waithing for the dam fix for the map pins) Hope i get a beta invite to test things early this time. Part 3 of Dun Morogh - they all were removed with Cata release. EDIT: Also this Ironforge quest no longer exist in-game but is shown in-addon. Not shure whats whit 31135. wowhead marks it all ally race and class .There are 6 moore quests whit this name, eash gnome class except hunter`s and dk`s have one so it mihgt be for one of them. Rest will be removed along whit those you posted in post 205 and 206. Dk`s start at 55 so thats probaly the only class that domt have one of these: The future of Gnomeregan quests. Rest of the questline is probaly very messed up whit wrong data on wowhead aswell gonna playtrough the quest chan on the Hunter and monk i made and correct it. It's a part 2 kinda. Sorry for a bit of spam I just list them as I go. All of the below were removed with Cataclysm but still appear in-addon under "Dun Morogh"
removed in next version along whit its horde counterpart quest whit the same name. Out of curiosity, is Viduus even still around? I was going through my pet battle quests and when I started the quest Grand Master Trixxy I got the notice "Updated Data Found - Please Contribute!" notice. This quest is triggered immediately after finishing the Battle Pet Tamers: Kalimdor quest, given by Audrey Burnhep. Firstly, absolutely awesome add-on, great work! I started playing on a new alliance toon and noticed if I select Felwood the Shimmering Expanse quest set appears :/ this is while I am in Darkshore if that helps at all. Edit: Oh I actually see what is happening: there are two Felwood entries. The first is Shimmering Expanse and the second loads Felwood. My bad. Hi, there was a note to send info, Thrall- warchief emissary, #25266. Was doing a goblin warlock . Thanks for the good work btw. Fixed in next version along whit the rest of the chain , thanks for reporting.